Author of the epic Star Force Origin series, Aer-ki Jyr's impressive galactic world-building is on full display in this stand-alone space opera adventure reminiscent of Ryk Brown, Christopher Nuttall, B.V. Larson, and Evan Currie. A new dawn is coming. It's been eons since Humans controlled the universe. Defeated by a mysterious enemy, the downfall of Humanity brought about a virtual dark age. Culture and technology stagnated in their absence. But now, trade is once again flourishing as Human artifacts resurface throughout the galaxy, resurrecting long forgotten advancements. And one such discovery might very well alter the course of the future forever. 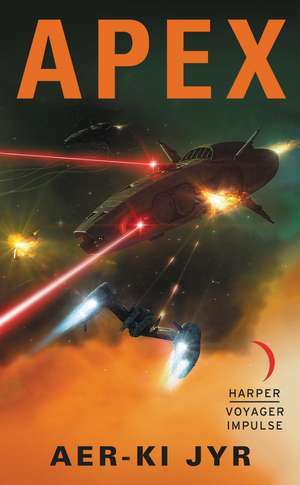 An epic space adventure, Aer-ki Jyr's APEX is a breathless race to the ultimate prize, with the very fate of the stars hanging in the balance. It's been eons since Humans controlled the universe, after their defeat by a mysterious enemy. With their downfall came a virtual dark age in which culture and technology stagnated. But now trade is once again flourishing as Human artifacts resurface throughout the galaxy, resurrecting long-forgotten advancements. And one such discovery may very well alter the course of the future forever.